Welcome to the 2019 Online Mail Order Peony Catalog. 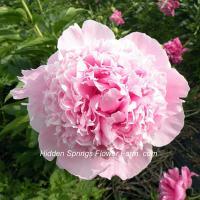 Brighten your garden with peonies from Hidden Springs Flower Farm. 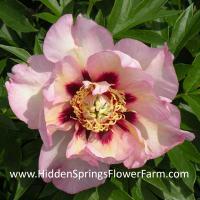 Let us know how we can help you in you peony plant selection. Enjoy your visit! Peony roots are shipped beginning the week of September 17 - October 15th as dormant, 3-5 bud, bare roots for fall planting. Peony experts recommend fall planting when peonies are developing a vigorous root system in response to the colder soil temperatures. Complete planting instructions are included with each order and on our website. Peony roots can be ordered from January through mid August for fall shipping. Excellent growing conditions in the north help peonies develop the largest eyes when allowed to mature their buds in the field and dug in Mid to late September. Growing them the extra few weeks to full maturity gives them a chance to go dormant and has produced larger eyes (buds) that develop into stronger stems the following spring. 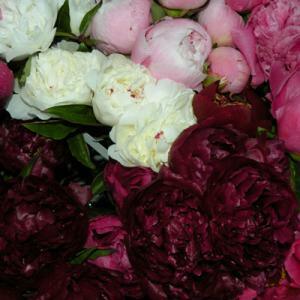 All the peonies that we offer are grown right here in Spring Grove, MN. Peonies grow best in USDA Growing Zones 3-8 which are cold climate areas with hard freezes for extended periods during the winter. We do not recommend growing peonies in zones 9 and 10 because it is too warm. The plants are cared for by Brigitte and Harvey right here on our family farm. The fields are nestled in a valley between hillsides covered with majestic oaks, walnut and hickory woodlands. We appreciate your visit to the web site or farm and thank those of you who have selected our peonies to prosper and grow under your loving care. As a small family farm all the work is done by Brigitte and Harvey. We are not a large corporation with no name, we take pride and responsibility for delivering a product we would like to receive ourselves. 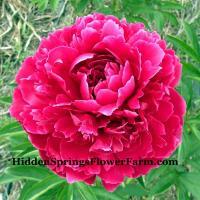 We hope you will take pride in growing the plants you purchase from Hidden Springs Flower Farm too.